To help you keep up with the news on solar flares, coronal mass ejections and other news from our Sun, @CNNLightYears suggests you follow the trio of accounts related to NASA's Solar Dynamics Observatory. 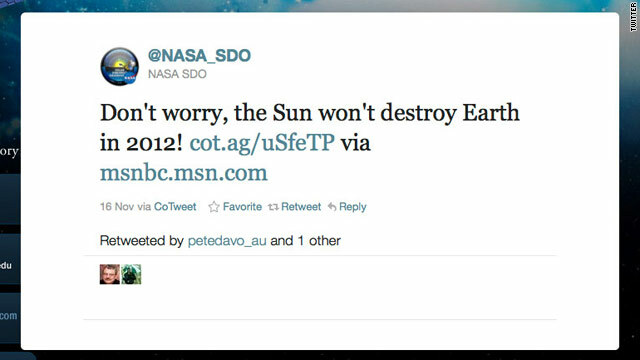 Managed by Goddard Spaceflight Center, @NASA_SDO posts the latest news about solar activity, straight from the source. SDO has a mascot, @Camilla_SDO, affectionately known as the "space chicken." Camilla Corona SDO's goal is to spread the news about the SDO mission through education and outreach activities. The newest SDO account is @NASA_SDO_EDU, an account dedicated to supporting science teachers and others interested in STEM (science, technology, education and math) education.